Here is a video of a jam I did this evening where I finally had everything setup and in sync. It took me a while to wrap my head around how to get this particular setup, but I can now say it works perfectly. Here is the workflow in the video. On the floor I have a Roland RC-300 loop station that acts as the Master Start/Stop with midi clock. The RC-300 is also setup to trigger three different bass lines, sort of like a verse, chorus, and bridge. ( That is my intent for future grooves ). 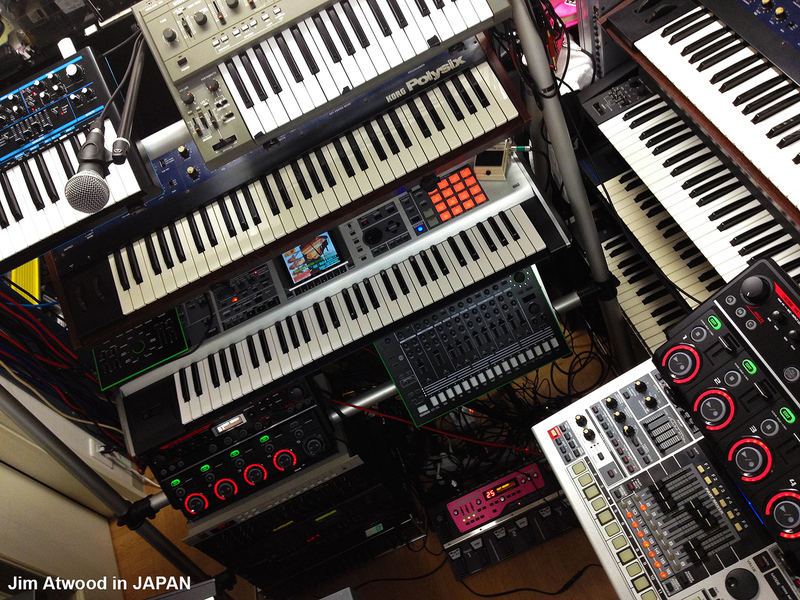 The RC-505 to my right is setup to trigger support synths, the Roland MKS-50 and Oberheim Matrix 1000. Those two synths are triggered from a Roland Fantom X6 where I can both play the sounds and change the patches. The actual sound I’m playing on the Fantom is the Oberheim Matrix 1000 module. There is also a Roland RC-505 to my left that is looping the Roland VT-3 transformer audio of my voice. I also have a foot pedal connected to the RC-505 so that I can trigger the stutter effect on the vocals. There are three sound loops. One is a high pitched chorus vocal. Another is a robotic sound, and the third is a radio phrase, all recorded from the VT-3. I’m using two midi patch bays, one for the Loopstations and another for the synths. This keeps the midi clock working properly. The drums are from the Roland MC-909 and the bass parts are from the Novation Bass Station 2. Basically, I have the Boss RC-300 setup to work on separating the verse, chorus, and bridge parts. ( The tracks are in single mode ) I then have one Boss RC-505 working the vocals parts. ( Multi mode ) The other RC-505 can record and loop supporting synth parts. ( Both single and multi mode ) The MC-909 acts as the sequencer for any midi parts. I can then play live on the Fantom X6 triggering synth modules as it’s easy to change external patches with. I can also use the non midi synths like the Korg Polysix for live playing. I found if the loop stations are organized and allocated to vocals, synths, and bass parts, they’re much easier to work with live. There are definitely a lot of fun possibilities here.